My lovely friend Jackie, gave me a fantastic Christmas present. Christmas I hear you cry! Well it has taken me this long to get myself together to sort it out. It was a voucher for a box of plants delivered to your door when you are ready. All supplied by a company called Rocket Gardens who seemingly sell plants, kitchen garden stylee. Mine was a window box selection suited to a tiny garden with a scratch of room for some pots. When the box came it was really exciting to open it up and find -nestled in amongst a wodge of hay - a glut of tiny plugs laid in neat rows. 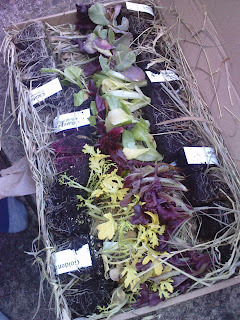 Mustard, mixed lettuce, spinach, chard, beetroot, mizuna, some herbs and spring onions too. Not only did I have all of these plants but I was sent a promotional pack of freebies too. More lettuce and mustard that I knew what to do with. And of course, all these salad leaves are cut and come again and are easy to grow and offer delicious leaves for much of the year. Last night then, being as creative and inventive as possible, I have planted these little beauties in amongst anything and everything where I could find a gap. now I will just need to be inventive with using the end results. Last year, I won a competition with the National Trust with this recipe using lettuce. Lettuce is one of those things that most think is used only in salads. But it is lovely to cook with too. Braise solid substantial lettuce, or shred into petit pois a la francaise. Use it to make soups and to wrap shredded meats with a delicious savoury sauce. Mr Mcgregor’s summer garden tart with roasted tomato salad. Rub the butter into the flour until the mixture resembles breadcrumbs. Stir in enough of the water to form a dough. Knead for a moment to smooth ball and chill for 30 minutes. Place the tomatoes on a baking sheet, top each half with a little garlic, drizzle with the oil and season well. Place in the oven and roast for about 45 minutes. Line a 23cm spring form cake tin with the pastry, prick the base, line with baking parchment, fill with ceramic baking beans - or a raw pulse works well – and bake blind for 20 minutes until the pastry is crisp. Fill with the peas, lettuce and crumbled cheese. Whisk together the eggs, milk and cream and fill the pastry case. Bake for about 30 minutes until the filling is set. Cool for 10 minutes before cutting. Transfer the roasted tomatoes onto a bed of salad leaves and dress with the vinegar. Slice the tart into 8 and serve with the tomatoes.